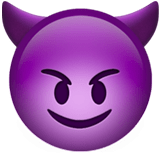 😈 Smiling Face With Horns Emoji is a face with devilish smile, inward facing eyebrows and horns on its head. This smiley generally means badass actions or even crimes. Use it to spitefully laugh at someone's failure, or show that you are planning something bad or inappropriate. However, in most cases, this playful mug serves to express gloating or coolness. Smiling Face with Horns Emoji was approved as part of Unicode 6.0 standard in 2010 with a U+1F608 codepoint, and currently is listed in 😀 Smileys & Emotion category. 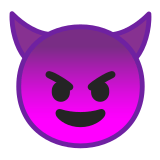 Use symbol 😈 to copy and paste Smiling Face with Horns Emoji or &#128520; code for HTML. This emoji is mature enough and should work on all devices. You can get similar and related emoji at the bottom of this page.